�The Monkees In Manhattan� (a.k.a. they help a producer get backing for a Broadway musical. Filmed At: Screen Gems Studios 2 and 10, Hollywood, CA, and Columbia Ranch Stage 34, Burbank, CA. Written by Gerald Gardner and Dee Caruso. �Look Out (Here Comes Tomorrow)� Written by Neil Diamond; Produced by Jeff Barry. �A Girl I Knew Somewhere� Written by Michael Nesmith; Produced by Douglas Farthing Hatlelid. �Words� Written & Produced by Tommy Boyce & Bobby Hart. In hijinks reminiscent of an old Marx Bros. routine (Room Service [RKO, 1938]), The Monkees arrive in The Big Apple via The Blem Line (�It�s Such A Pleasure To Take Blem And Leave The Driving To Them�) for a new rock �n� roll musical produced by aspiring Broadway producer McKinley Baker. The boys book in at The Compton Plaza where he's staying at room 304 and allows them to lodge with him since they don't have any more money, having spent it all on busfare. But trouble soon follows when Weatherwax, the hotel manager, gives Baker an hour to leave the building for non-payment of rent. Since Baker's backer won't have the rent money until noon which is three hours late, The Monkees plan to buy time while Baker sneaks out the back to get the money. Meanwhile, Weatherwax informs Bunz, his desk clerk, the real reason to get Baker out is that, in an hour, a bigshot from a rabbit breeder�s convention will be given hiss room. Just then the drunken conventioneer arrives with two rabbits and decides to wait at the bar for his room. When Weatherwax and Bunz arrive at room 304 to evict them, Micky disguised as a doctor pretends to treat Peter who has polka dots all over face, claiming that he has the plague. To make sure Peter really is sick, Weatherwax sends for the hotel doctor but Micky manages to frighten him off by threatening to sic the ethnics practice committee on him. Weatherwax then plans to starve them out as the drunken rabbit breeder�s conventioneer keeps returning at the desk from the bar with more rabbits each time. Michael reacts to his plan by sending Bronislaw Kolinovsky, a waiter, to room 305 which is occupied by a newlywed couple on their honeymoon. Michael calls him to their suite and manages to get him on their side by promising him a part in their show. Finally, an impatient Weatherwax and Buntz summon the house detective to throw The Monkees out, resulting in a chase all over the hotel, fire escape, outside the hotel and through New York City to the tune of �The Girl I Knew Somewhere.� After eluding them, The Monkees sneak back into their room via the fire escape to eat lunch provided by the waiter. Weatherwax and Buntz decide to take them by surprise and goes to suite 304 only to find the newlywed couple inside instead. Realizing that they switched the room numbers, he enters 305 to toss them out once and for all as Baker arrives just in time by noon along with the newlyweds next door, with the groom asking assistance to open a champaign bottle! However, Baker has bad news: his backer backed down. Weatherwax threatens to call the police if they�re not gone in 20 minutes, and Baker and The Cool Quartet both are left with no alternative but to acquiesce. On leaving The Compton Plaza, Peter notices a Millionaire�s club across the way. The Monkees see this as a chance to save McKinley�s play, and so they go there in disguise as millionaires: David as David Armstrong Jones, who claims his family dates back to the earliest rich people; Micky as Sheik Veroob Dolenza (who offers a new wing to the building as charity! ); Michael as H.L. Nesmith, owner of a Texas ranch called Houston; and Peter as Peter DeWitt, a rich man�s son (who�s in garbage disposal!). Having gotten comfortable with the members, The Monkees explain the play and how it goes singing �Look Out (Here Comes Tomorrow)� in a sequence of better Monkeeshines gone by. By the end of the song, the guys discover all the members fast asleep courtesy of the butler with a glass of brandy. Having backed up a few shows in the past, the impressed butler decides to back up the show himself to their amazement. Back at the hotel, Baker decides to decline the butler�s backing because the butler insists on replacing the four boys with four girls. However, The Monkees insist Baker grant the butler�s wish so he can get his own producing career going. Just as they are about to depart The Compton Plaza, Weatherwax informs them of their staggering hotel bill of $180 for their room, food and incidentals! Since they can�t afford to pay for the bill, they wind up as employees with Michael as desk clerk and Micky, Peter and David as bellhops bearing cages full of the conventioneer�s rabbits, offspring of the original pair. The Monkees� express their feelings of success on them; David and Peter hamming it up with makeup artist Keeva Johnson; Michael explains the importance of owning his own house; The Monkees singing �Words�. The set of Room 304 in The Compton Plaza Hotel was previously filmed as a room adjoining The Royal Suite at The Ritz Swank Hotel in Episode No. 1, �The Royal Flush�. �The Monkees In Manhattan� (a.k.a �The Monkees Manhattan Style�) and �The Royal Flush� are the only 2 episodes of the series in which The Monkees wore their grey business suits throughout nearly an entire epsiode. This is one of 2 directorial efforts for The Monkees by Russell Mayberry; his other was the next episode; "The Monkees At The Movies." The version of �Look Out (Here Comes Tomorrow)� used in �The Monkees In Manhattan� (a.k.a �The Monkees Manhattan Style�) features an intricate organ solo part that was deleted from the final version which was used on the More Of The Monkees LP. Collector's Note: This version would remain unreleased until 2001, when it was finally released as part of Rhino's Monkees Music Box compilation (R2 76706); another mix can be found as a Bonus Selection on Disc 2 of Rhino's August 15, 2006 2-CD Deluxe Edition reissue of More Of The Monkees (R2 77744). A similar version featuring vocals by Peter Tork was included as a bonus selection on Rhino's November 15, 1994 CD rerelease of More Of The Monkees (R2 71791). Some footage from �Look Out (Here Comes Tomorrow)�'s accompanying romp seen in �The Monkees In Manhattan� was later used in the "Remember Next Year" NBC-TV 1967-68 Fall Preview with Jan Murray and Danny Thomas. Look carefully at the musical number for �Words�---appearing here in an early version of the song that was later remade for the B-side of the Colgems 66-1007 single and The Monkees' fourth album, Pisces, Aquarius, Capricorn & Jones, Ltd.---and you will notice a slight difference in The Monkees� musical roles: they have all been swapped! Here, David is playing the drums, Micky is playing the tambourine, Peter the guitar, and Michael the bass. Collector's Note: The original �Words� was finally released 22 years later on Rhino's Missing Links Volume 2 (R2 70903), in a mix which, unlike the TV version, adds an intricate "backwards tape" section! Another mix was included as a Bonus Selection on Disc 2 of the 2006 2-CD Deluxe Edition reissue of More Of The Monkees. For �The Monkees In Manhattan�'s repeats on CBS Saturday Afternoon, �The Girl I Knew Somewhere� was replaced by the Steven Soles/Ned Albright song �Acapulco Sun�. "The Monkees In Manhattan" incorporates footage (used and unused) from Episode No. 2, "Monkee See, Monkee Die", No. 3, "Monkee Versus Machine", No. 4, "Your Friendly Neighborhood Kidnappers", No. 7, "The Monkees In A Ghost Town", No. 9, "The Chaperone", No. 10, "Here Come The Monkees (orig. pilot film)", No. 12, "I've Got A Little Song Here", No. 14, "Dance, Monkee, Dance", No. 16, "The Son Of A Gypsy", No. 17, "The Case Of The Missing Monkee", No. 22, "The Monkees At The Circus", No. 23, "Captain Crocodile", and No. 27, "Monkee Mother". Snippets from this segment featuring Peter wearing lopsided bunny ears and grinning and Michael, after the �Look Out (Here Comes Tomorrow)� romp, saying "Uh, hello?" can be seen in the Season-2 opening for The Monkees. �The Monkees In Manhattan�'s original Screen Gems Storyline reveals a frantic, yet futile attempt to get Mr. Compton, the hotel owner, to back the show. As The Monkees book into The Compton Plaza Hotel, David Jones can be heard singing "New York, New York" ("New York, New York, what a wonderful town!/The Bronx is up and The Battery's down!"). The song was composed by Adolph Green, Leonard Bernstein and Betty Comden and performed by Gene Kelly, Frank Sinatra and Jules Munshin in the film On The Town (MGM, 1949). While chatting with a member at the Millionaire's Club, David makes reference to the Mark Goodson-Bill Todman game, What's My Line? (CBS, 1950-67). Seven episodes ago, in No. 23, �Captain Crocodile�, The Monkees did an affectionate spoof of What's My Line?, called What's My Scene?. When noon chimes, Micky, with cowboy hat and gun holster, draws and intones "High noon!," imitating Gary Cooper as Marshall Will Kane from the 1952 United Artists Western of the same name. Interestingly, "high noon" is also the time in Episode No. 33, "It's A Nice Place To Visit..." (a.k.a. "The Monkees In Mexico"), the Season-2 debut, where El Diablo (Peter Whitney) challenges Micky to a duel of honor! In the Millionaire's Club, David "Armstrong" Jones appears in the same tuxedo he wore in Episode No. 4, "Your Friendly Neighborhood Kidnappers", No. 14, "Dance, Monkee, Dance", and No. 23, �Captain Crocodile�, whereas Michael "H.L." Nesmith is seen in his guise as Billy Roy Hodstetter from Episode No. 15, �Too Many Girls� (a.k.a. "Davy And Fern"). Buntz's line "Good thinking, Chief." is an allusion to Get Smart (NBC/CBS, 1965-70); 99 tended to say "Good thinking, Max!" at various times, even though usually it was 99 who had come up with a good idea. A circus midget and a juggler appear briefly during the �Girl I Knew Somewhere� romp; both are obvious throwbacks to Episode No. 22, �The Monkees At The Circus�. 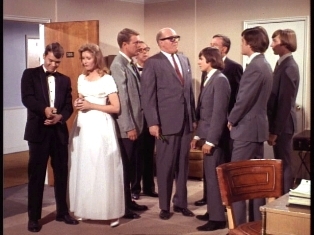 Aside from numerous quickchange costume changes, The Monkees remain predominantly clad in their "mod" grey business suits throughout the whole episode, marking the second such occasion on the show the boys remain in one set of clothing for the entire duration of the show (besides Episode No. 18, �I Was A Teenage Monster�). Michael uses his hands to simulate scintillating running signs on theater marquis. He also did so in �I Was A Teenage Monster�. The late Phillip Ober (Weatherwax) had a previous stint playing Gen. Wingard Stone in the first season of I Dream Of Jeannie (NBC, 1965-70). A second actor to play a general on Jeannie, the late Barton MacLaine (Gen. Martin Peterson), portrayed Black Bart/Ben Cartwheel in Episode No. 45, "The Monkees In Texas". Ober was seen with pre-Monkee guests Joe Perry (�The Monkees In The Ring�) and Bobby Sherman (�The Monkees At The Movies�) in an October 29, 1965 episode of Honey West (ABC, 1965-66), "The Princess And The Paupers." The late Olan Soule (the waiter) would later spend a great deal of his time providing the voice of the animated Batman, beginning with Filmation's The Batman/Superman Hour (CBS, 1968-69) and its sequels, and continuing through the many incarnations of Hanna-Barbera's Super Friends (ABC, 1973-75). Soule also played Mr. Pfeiffer in My Three Sons (ABC/CBS, 1960-72), Carmichael in Battlestar Galactica (ABC, 1978-79), Ray Murray in Dragnet 1967-1970 (NBC, 1967-70) and Ray Pinker in the original 1951-59 NBC version and the 1954 Universal big-screen version of Dragnet. With Monkee guest Allan Emerson ("Monkees Marooned"), he previously appeared in the November 6, 1966 segment of The FBI (ABC, 1965-74), "Ordeal," and, with Stuart Nisbet ("The Monkees In Texas"), in "The Big Accident" (a.k.a. "The Big Hit-and-Run Driver", 4/6/67). Geoffrey Deuel (Groom) is the brother of the late Pete Duel, best remembered as the first Joshua Smith in the TV Western Alias Smith And Jones (ABC, 1970-73). Deuel also turned up on The FBI, appearing with Arch Johnson (�The Chaperone�) in the December 29, 1968 episode, "The Widow." The late Foster Brooks (a.k.a. "The Loveable Lush") created his famous drunk act (in which he plays a drunk trying to hide his drinking) in the 1960's. In reality, he was a spokesman for MADD (Mother's Against Drunk Driving) and did public service announcements on their behalf. A former newscaster and disc jockey, Brooks' national debut was on The Tonight Show Starring Johnny Carson (NBC, 1962-92), after entertainer Perry Como spotted Brooks doing his drunk act at a celebrity golf tournament; afterwards the singer invited Brooks to be his opening act at the opening of the new Hilton Hotel in Las Vegas. His television work included the role of Miles Sternhagen in Mork & Mindy (ABC, 1978-82), as well as being a regular Roaster on The Dean Martin Celebrity Roasts. Susan Howard (Bride) is best remembered for her role as Donna Krebbs in the TV series Dallas (CBS, 1978-91). Trekkies recognise her as Mara from the November 1, 1968 "Day Of The Dove" episode of Star Trek (NBC, 1966-69). The late Winstead Sheffield "Doodles" Weaver (the butler who saves the play), well remembered at Stanford for his many pranks and practical jokes as well as a varied acting career (including his spoonerizing character for Spike Jones' Radio Show ["Professor Feitlebaum"]), was brother of NBC-TV executive Sylvester "Pat" Weaver and uncle of actress Sigourney Weaver.